With everything going on lately (like publishing fabulous books, hosting amazing blog tours, creating awesome new video projects… you know, stuff! ), we almost didn’t get to show you our newest It’s Sew Emma patterns! So we’re doing an IT’S SEW EMMA PATTERN ROUND UP! 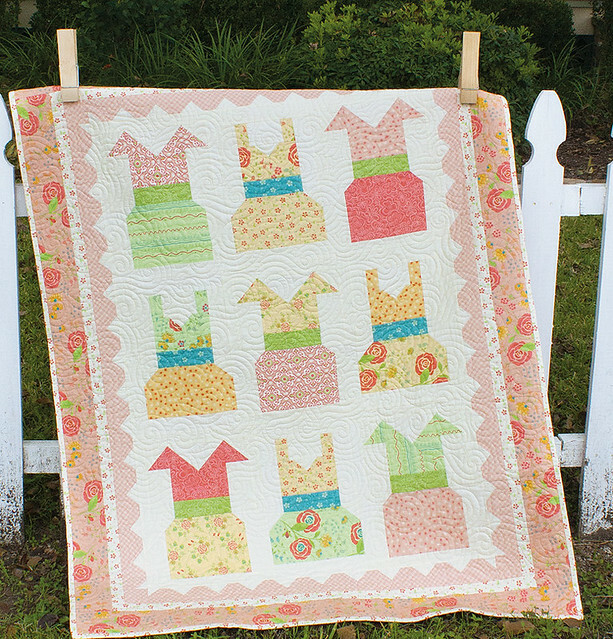 Today we are introducing you to our full-sized quilt patterns and tomorrow you will get to meet our newest Little P's! It’s been an unseasonably long winter. I think Sunbeams is just the thing to welcome these early Spring days! Glowing stars radiate out in a diamond pattern against a patchwork of mixed colors, like sunbeams filtering through new leaves, flowerbuds and branches. Sunbeams is Fat Quarter friendly, and we include sizes from lap to king! You can’t go wrong with this pattern; brights, darks, pastels, traditional, modern and any combo of these will work in this design. 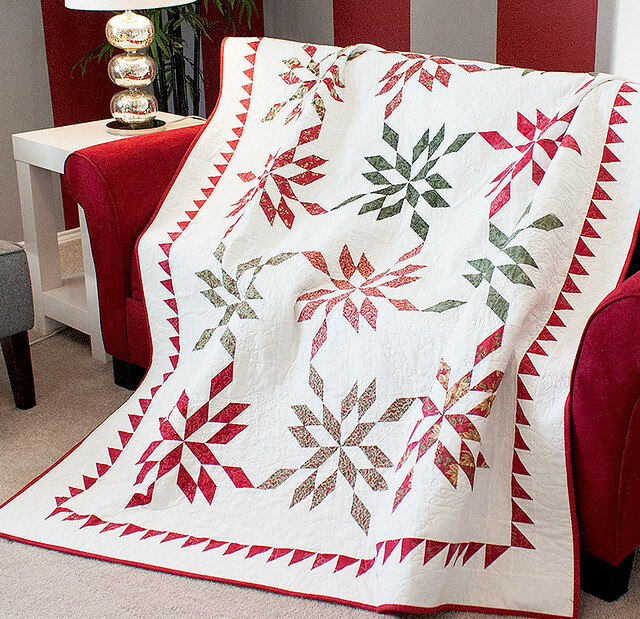 We’ve seen one made with Bonnie & Camille fabric, and we love it almost more than our version. 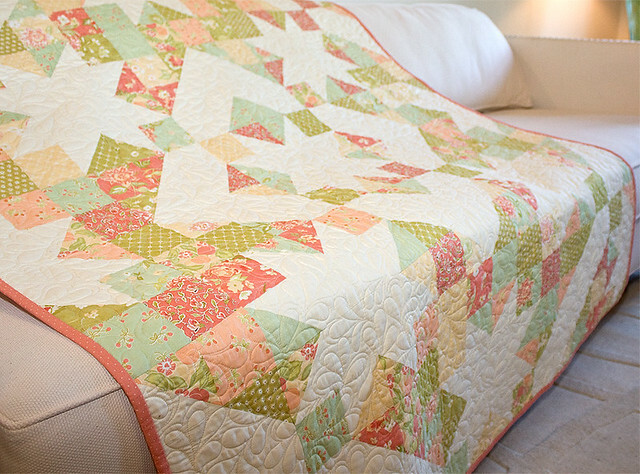 Our cover quilt is made in Mirabelle by Fig Tree Quilts, and both patterns and Sunbeams Quilt Kits are available now. 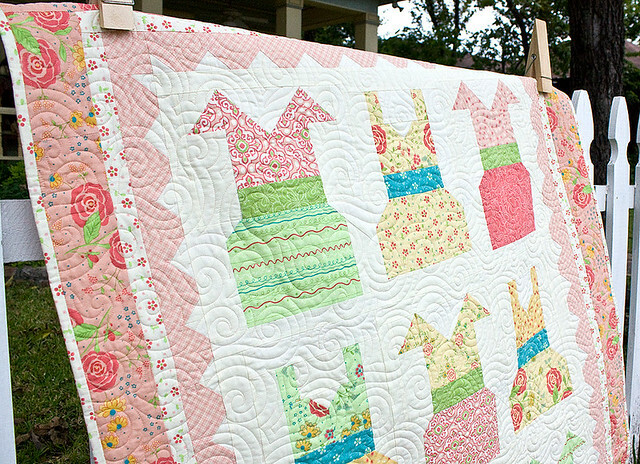 For the Frill of It, otherwise known as the quilt with all those darling dresses! This is a fashionista’s playground. We took a few Fat Quarters and a few Fat Eighths to mix and match these sweet frocks. Like any good stylist, we’re not afraid to play with prints and patterns and wound up with nine completely different outfits! The frilly inner border is just icing on this very fashionable cake. This is an adorable way to showcase your favorite prints, and this size makes a small lap quilt or large wall hanging. Our version is made with Chance of Flowers by Sandy Gervais, and the patterns and quilt kits are out now! ‘Tis the season! …no, not yet, but it’s never too early to start planning projects for Winter! I am so in love with our Good Tidings quilt. These lovely wreaths and snowflake-y stars come together in a perfect way and form a secondary snowflake design. 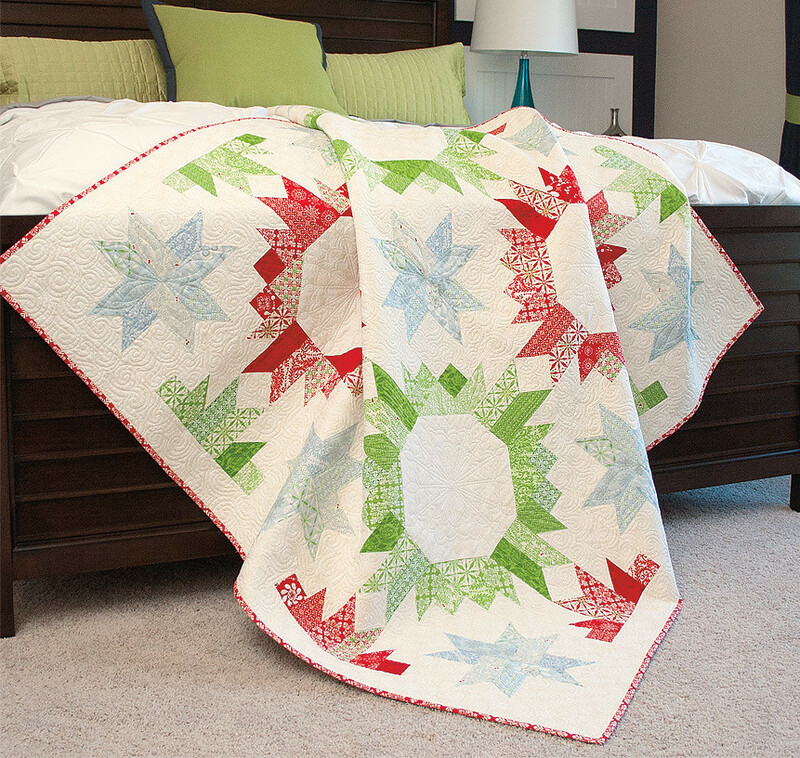 The myriad of reds and greens give it a glittering effect, and the ample negative space makes room for quilting. 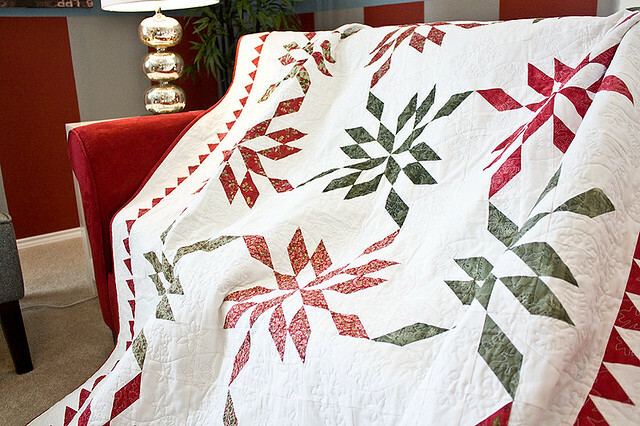 Our cover quilt, made from Solstice by Kate Spain, was quilted with allover swirls and elaborate snowflakes inside the wreaths. If you want more drama, try other colors for your version. Cream stars, gold and silver wreaths on deep navy, or whisper pink, mint and gray on vibrant orchid. The world is your snowflake, I mean, oyster! The pattern is available now, and kits will be available in May! Hey, star-lovers! Last Fall we spotted an amazing quilt block and could not get it out of our minds. 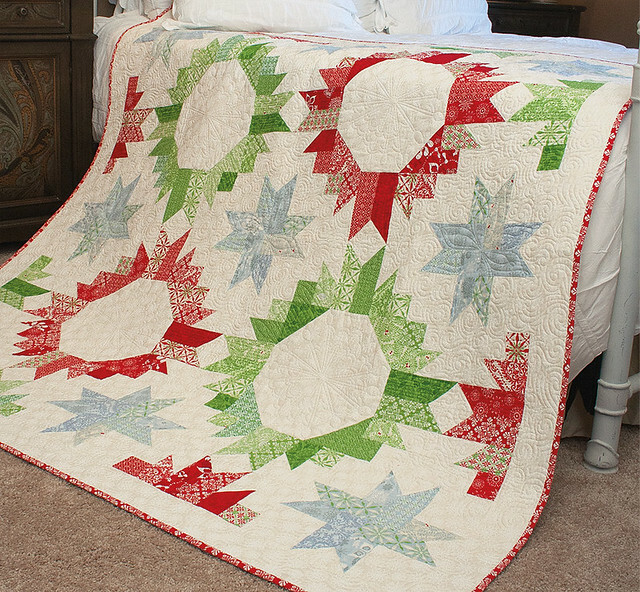 The idea crystallized into Winterberry, with these gorgeous swirling star blocks. They oppose each other, lending grace, balance and motion to the design. A delicate ring of half-square triangles encircle the blocks, and that’s all the decoration it needs. We made our quilt from Winterlude by 3 Sisters. It is large and cozy, great to throw on a twin bed or couch. The pattern is out now, and kits will be available in June. 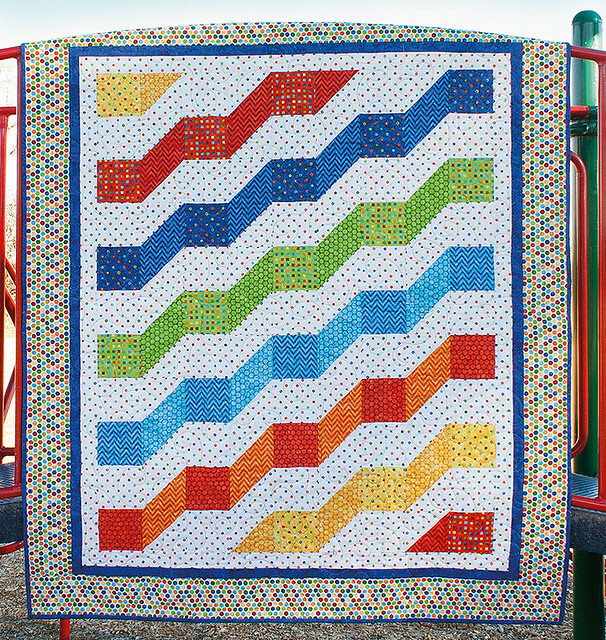 Rainbow River is a fun and quick design you will never tire of! 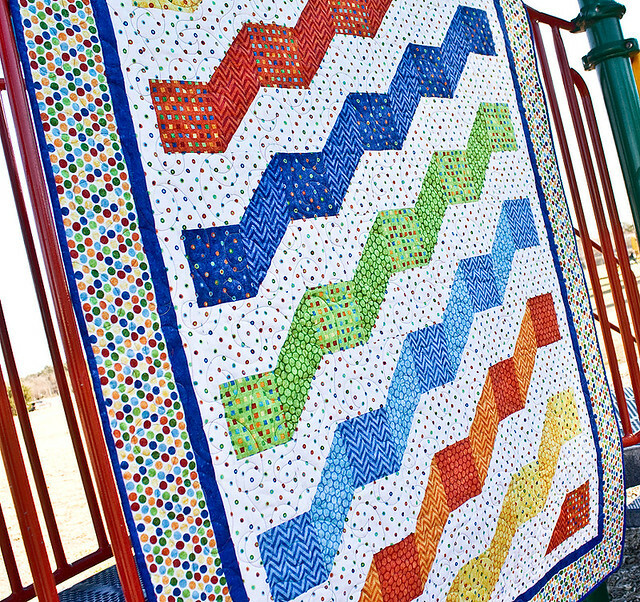 Fat Quarters make up a dazzling 3-D waves of color, and you will love how easily it comes together. 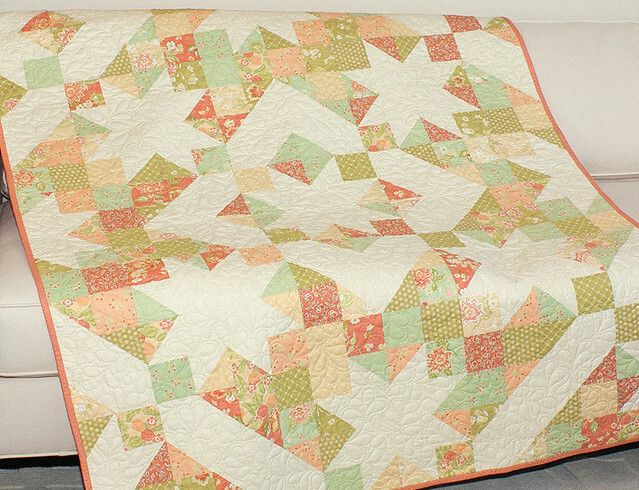 For this quilt, the brighter the better, and we used Stonehenge Kids fabric to set it off. This pattern comes in crib, lap and twin bed sizes, so just pick the size you need! It is a great quilt to make for any youngster, and it’s even more fun if they get to choose colors with you. Patterns and kits are available now! Stop back by tomorrow to meet our newest Little P's! These pint-sized patterns are perfect for baby gifts!